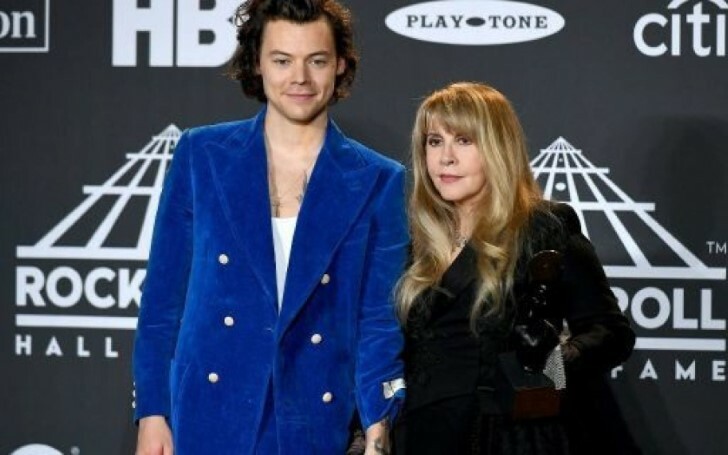 Stevie Nicks mistakes Harry Styles as the band member of NSYNC. Oh no we have a Wrong Direction case here. Well, it appears that American singer Stevie Nicks is not good at all with remembering boybands. Or maybe she is not fond of them. The 70 years old singer was among the few honorees including all four members of The Beatles at the Barclays Center organized by the Rock and Roll Hall of Fame on Friday evening. The night celebrated the 70 years old legend as the first woman to receive her Awards not once but twice for the different stages in her career span. 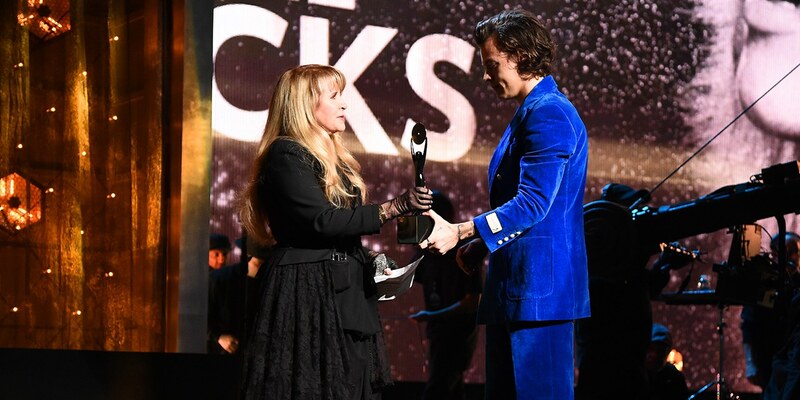 Harry Styles presents the Rock and Roll Hall of Fame Award to Stevie Nicks. The 'Edge of Seventeen' singer also ignited the beautiful event with a four-set song's performance, including “Stop Draggin’ My Heart Around” which was joined by Harry Styles to fill in for the late Tom Petty. Furthermore, it was Styles who introduced the Fleetwood Mac songstress on the stage for her Award. It then occurred backstage when the reporters asked the rock icon to speak on her friendship with the 25 years old pop icon and how they encountered. And as she began speaking, she mistakenly regarded the young singer as a member of NSYNC, rather than One Direction. Realizing what she just said after hearing a burst of loud laughter from the audience, the sweet old lady immediately corrected herself with an apology. The "Dreams" singer continued with a joke: "Sorry, not ‘NSync. Sorry, I’m never going to live that one down, I know that” adding: "One Direction. I liked One Direction, too." Nicks then added speaking on how Harry "took a risk" when he made his first solo record; a self-titled album released two years back in 2017 and that she found his likeness for classic music very impressive. As a matter of fact, Stevie considers Styles familiar in a lot of ways to her Fleetwood Mac band members. In her words, she said: "He just fits in with all of us. He loves our music and he loves the whole ‘70s and ‘80s and ‘90s music he has been doing all this time." As for Harry and his love for the singer, he covered Fleetwood Mac in 2017 for BBC Video that received tons of positive messages and praise from the fans. Styles was also very vocal the night how he has always been a fan of the singer before he presented her. The 'Sign of the Tines' hitmaker said: "She is forever current. She is forever Stevie, but what exactly does that mean? In my family, we listened at home, we listened in the car, we listened wherever we could. ‘Dreams’ was the first song that I knew all the words to before I really knew what all the words meant." Styles further added: "She is so much more than a role model. She’s a beacon to all of us. Whenever you hear her voice, life gets just a little bit better. When she sings, the world is hers, and it is yours. She is everything you’ve ever wanted in a lady, in a lover, in a friend. Stephanie Nicks, I love you. We all do. And that is true, Stevie." Harry rose to fame after he became one of the fifth members of One Direction when he auditioned for X-Factor in 2010. The band members including Niall Horan, Liam Payne, Louis Tomlinson apart from former band member Zayn Malik who parted from the group in 2015 then took a hiatus in 2016 to focus on their solo careers. As for NSYNC who was successful in the late '90s and early 2000s consisted of band members; Justin Timberlake, Joey Fatone, JC Chasez, Lance Bass, and Chris Kirkpatrick.